Last Sunday, the Temiscaming Titans traveled down to Bradford to take on the Rattlers. Temiscaming entered the game with a perfect 14-0-0 record, while Bradford had not been defeated in regulation with a 12-0-1 record entering action on Sunday. In what was being billed to be the best match of the season; Temiscaming reigned triumphant, as they handed Bradford their first regulation loss 3-1. As expected, both teams played a conservative game, with neither team registering a goal in the first period. Temiscaming’s Chris Levesque opened the scoring, with 2:57 remaining in the second. Stanislav Nikonov squeaked one in for the Rattlers, scoring with just nine seconds remaining in the period. All square, the clubs headed to the final frame. Temiscaming was able to get two quick goals, courtesy of league point leader Andre Leclair and Richard Abbott. Bradford failed to responded, inevitably receiving their first regulation loss of the season. Both teams played very discipline games, receiving only a handful of penalties a piece. For the first time this season, Bradford’s opponent outshot the Rattlers; 43-36. Despite being outshot, Temiscaming’s 16 year old goaltender, Reilly Turner, made the biggest difference for the Titans. Rob Sutherland put on an impressive performance for his Rattler debut. The goaltender claimed second star of the game honours, recording 40 saves for a .930 save percentage. 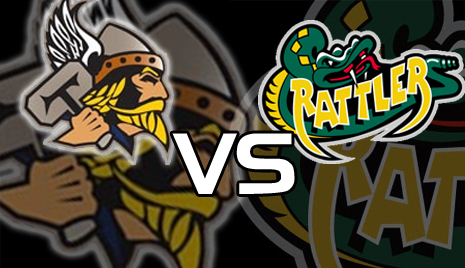 This game also marked forward Evan Haga’s first game as a Rattler, and the return of Swede Alexander Jonsson. Despite losing their first game, the Rattlers will push onward to Thornhill next Saturday (Nov. 19) to take on the Toronto Canada Moose(6-11-1). The Moose will also be looking to bounce back, as they are coming off a 12-2 lose against the Orangeville Americans from this past week. Until then, the Rattlers will continue their on and off ice workouts. Bradford will be back in action at home next Sunday, November 20th to take on the Deseronto Storm at the Bob Fallis Sports Centre.